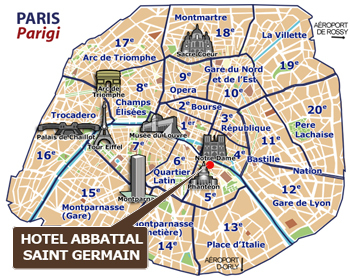 Taxi or RER direction Paris to Saint-Michel Notre-Dame station (7 minutes by foot from the hotel) or transfer to metro line 10 direction gare d'Austerlitz and get off at Maubert-Mutualité station (150 meters from the Hotel). Taxi or Orlyval to Antony, then take RER B direction Paris to Saint-Michel Notre-Dame station (7 minutes by foot to the Hotel) or transfer to metro line 10 direction gare d'Austerlitz and get off at Maubert-Mutualité station (150 meters from the Hotel). Taxi or take metro line 4 direction Porte d'Orléans to Odéon then transfer to metro line 10 direction gare d'Austerlitz and get off at Maubert-Mutualité station (150 meters from the Hotel). Taxi or take metro line 10, direction Boulogne Pont de Saint-Cloud and get off at Maubert-Mutualité station (150 meters from the Hotel). Taxi or take metro line 4 direction Porte de Clignancourt to Odéon then transfer to metro line 10 direction gare d'Austerlitz and get off at Maubert-Mutualité station (150 meters from the Hotel). Taxi or take metro line 12 direction Mairie d'Issy to Sèvres-Babylone then transfer to metro line 10 direction gare d'Austerlitz and get off at Maubert-Mutualité station (150 meters from the Hotel). Taxi or metro line 4 direction Porte d'Orléans to Odéon then transfer to metro line 10 direction gare d'Austerlitz and get off at Maubert-Mutualité station (150 meters from the Hotel). Taxi or take bus 63, get off at Monge-Mutualité station. From the motorways, take the ring road and get off at porte de Bercy, take Paris centre to Pont Marie, cross 2 bridges to Saint-Germain Boulevard. 10 minutes: City Hall and the department stores. 10 minutes: The Louvre Museum, the Orsay Museum, the Museum of Natural History, the François-Mitterrand National Library. 15 minutes: The Eiffel Tower, Invalides, the Rodin Museum, the Place de la Concorde. 20 minutes: The Garnier Opera House, the Champs-Elysées, the Arc de Triomphe, le Grand Palais.